Noel Fielding and Richard Ayoade star with Chris Pratt, Elizabeth Banks, Will Arnett, Tiffany Haddish, Stephanie Beatriz, Alison Brie, Nick Offerman, Charlie Day and Maya Rudolph in the new big screen animated adventure The LEGO® Movie 2. The kids will love this movie and will demand new Lego purchases, I am warning you mums and dads. Fielding (The Mighty Boosh) voices the role of charming vampire Balthazar, a LEGO minidoll who runs a spa, while Ayoade takes on the voice of Ice Cream Cone, an efficient but impatient royal assistant and party planner for the story’s Queen Watevra Wa’Nab – a new character played by Tiffany Haddish. The LEGO® Movie 2 is released in UK cinemas in 2D and 3D on the 8th February 2019. 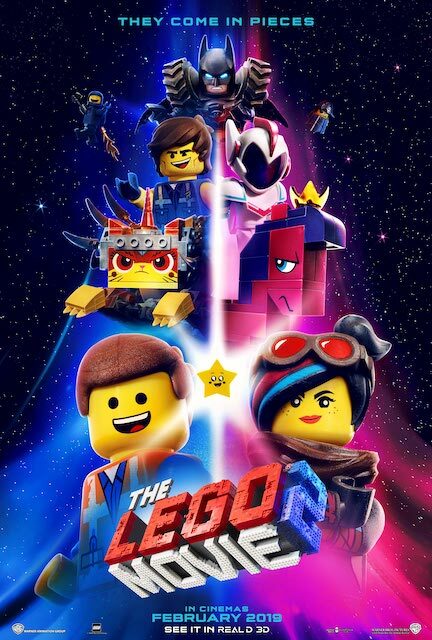 Reprising their fan-favorite characters from The LEGO Movie are Chris Pratt as Emmet, Elizabeth Banks as Lucy (aka Wyldstyle), Will Arnett as LEGO BatmanTM, Nick Offerman as Metal Beard, and Alison Brie as Unikitty. They are joined by Tiffany Haddish, Stephanie Beatriz, and Arturo Castro as, respectively, new characters Queen Watevra Wa-Nabi, Sweet Mayhem and Ice Cream Cone. The Lego Movie 2 is a fun adventure with all the familiar faces from the first film plus new funny and quirky characters culminating in an epic intergalactic wedding between Batman and a husband-hunting ever transforming brick Queen Watevra Wa’Nabi (Tiffany Haddish). I quite liked the live-action familial sequences to create a framework for the lego bricks story to be included. The catchy songs are good including the tune Catchy Song will be played a lot in the near future. Chris Pratt returns as the voice of Emmet and his positiveness constantly expressed by his strapline “Everything Is Awesome,” even when everything really isn’t. Duplo bricks are shown as invaders of Bricksburg to the point that they destroy and transform into Apocalypseburg. Chris Pratt’s Emmet is as cheery and good-hearted as Star Lord and goes around with his music played in a brick type of walkman which is a hint to The Guardians of the Galaxy for the parents watching and for young fans of the Marvel series. There are lots of jokes, puns and other meta references to Superman, Ruth Bader Ginsburg, teen vampires, NBA stars, dinosaurs from Jurassic Park. The story is a bit convoluted but serves the purpose of introducing all Lego bricks figures from blockbuster movies and showcase several ways kids can play with the construction sets, building brand new creations out of existing sets. It’s all about teaching kids to play together in harmony and creatively. The child reporters from the London Mums’ kids club really enjoyed the movie and rated it very highly while some of the parents fell asleep in the newly refurbished seats at the Cineworld Leicester Square (wink). Everybody got some me-time at least! LEGO, DUPLO, the LEGO logo, the minifigure and the brick and knob configuration are trademarks of The LEGO Group. ©2018 The LEGO Group. Used with permission. All rights reserved. This entry was posted on Wednesday, February 6th, 2019 at 11:07 am and is filed under Movies. You can follow any responses to this entry through the RSS 2.0 feed. Both comments and pings are currently closed.